The Forman’s Smokehouse Gallery is a chic, elegant and unique industrial-style space in Central London, which reflects the structure of the opposite Olympic stadium. Floor 2 compromises an exceptional lighting rig, plus adaptable floor space that has been used for private sit-down dinners for 30 people, award ceremonies for 350, and standing cocktail receptions for almost 1000 people. Floor 2 has a spacious reception area, offering beautifully appointed cloakrooms. There’s also a large 135sq.m roof terrace here, with an LED structural lighting system that can be changed to suit your colour theme. 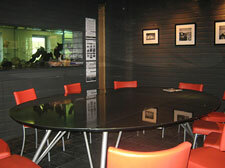 The space can also be used as an art gallery, and is fully air-conditioned with its own commercial standard kitchens. The Restaurant is a contemporary, bright and airy space, with floor to ceiling windows and riverside views of the Olympic park. Ideal for small meetings or intimate meals this room also provides a covered balcony overlooking the River Lee and Old Ford Lock. 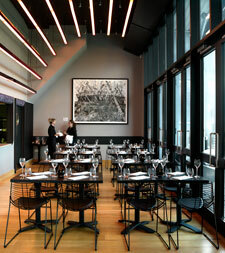 Floor 1 has a partition wall onto the restaurant that can be used as a break out space. With its oak floors and large windows with views of the Park, this ‘modern classic’ also offers a viewing gallery into Forman’s Salmon Smokehouse. The Aquarium is a stylish choice of meeting venue indeed, and features black wood paneled walls with directional spotlights and an enormous fish tank containing salmon. With a beautiful boardroom table seating 14, this room can also be used as a breakout for events taking place in a larger space. 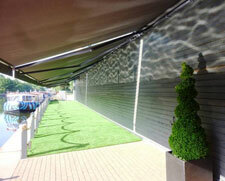 Forman’s Lockside is an outdoor riverside space with extendable automatic awnings to provide rain shelter, plus a manicured lawn and terraced area, facing the Olympic Park. It’s perfect for 60 guests to enjoy a seated meal, or 100 to stand for a reception. Forman’s Fish Island also has a stunning yard space offering 1.5 acres (5500 square meters) of uncovered and can be used for large scale events. 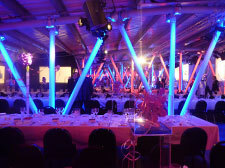 You can erect temporary structures such as marquees or art instillations here, and over 3000 guests were entertained during the Forman’s Fish Island Riviera on the closing night of the Olympics. 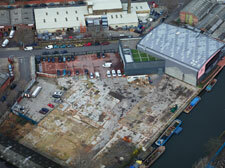 This enormous, blank canvas space can also be used for additional parking for events taking place within the main venue. Function Fixers are able to book Forman’s Fish Island at less than the market price. Contact us here for more details!